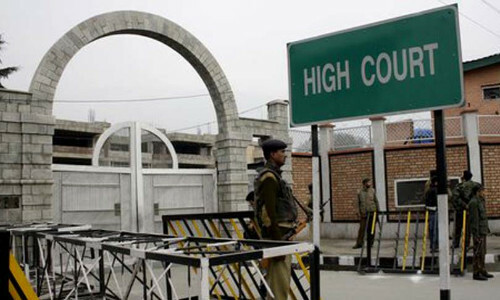 In a first, the Jammu & Kashmir High Court has achieved a remarkable feat by allowing justice to reach the threshold of people in the remotest areas by facilitating their access to courts even if they reside beyond its reach. The High Court of Jammu and Kashmir, with the previous approval of the Governor, has in exercise of the powers conferred by Section 554 of the J&K Criminal Procedure Code and by Section 122 of the J&K Civil Procedure Code respectively made amendments to the Jammu and Kashmir General Rules (Criminal) of 1988 Svt and the Jammu and Kashmir General Rules (Civil) of 1978 Svt. by the insertion of chapters XIII and VIII, respectively. •	A party residing in a remote area, desirous of filing a case before a Judicial Magistrate may file the same before the nearest approved centre operated by the Government of India/state government approved by the high court or the nearest post office established by the Department of Post, Ministry of Communications, Government of India, in collaboration with the Jammu and Kashmir Legal Services Authority, High Court of Jammu and Kashmir. The case may be filed in the proforma annexed as Schedule "B" appended with chapters or in any other format conveying the facts giving rise to the case, the issues/questions raised and the prayer sought by the party. •	A para legal volunteer/panel lawyer duly appointed by any legal service institution attached to the concerned approved centre/JKSLSA/District State Legal Services Authority (DSLSA) may assist the party in drafting/filing of the case at the designated approved centre. •	In case of filing before the approved centre, the in-charge of the approved centre shall maintain the entire record of filing of the cases before the designated approved centre, both in soft form as well as in registers specially maintained for the purpose. •	In the event of filing of the case before the post office, the postmaster concerned shall maintain the entire record of filing of the cases both in soft form as well as in registers specially maintained for the purpose. •	Upon presentation of a case, the in-charge of the approved centre/postmaster concerned shall scan the petition/appeal/complaint, application and documents, whereafter he shall transmit the same immediately through e-mail to the court of competent jurisdiction where the printout of the same shall be taken and the case shall be registered accordingly. The original record of the case shall be retained by the approved centre and the same shall be transmitted to the concerned court, as soon as possible, by any available means of transport. •	On the hard copy of the appeal/petition/complaint, signature or thumb impressions, as the case may be, shall be affixed on every page by the party in the presence of the in-charge of the approved centre/postmaster, who shall countersign and date the same on the last page after endorsing the name of the person presenting it and the time of its receipt. •	The appeal/petition/complaint shall then be placed in a sealed cover by the postmaster, who shall obtain the signatures of the party, and the PLV (if present) on the sealed cover, and shall also countersign and date the same. The endorsement of the postmaster shall be treated as proof of authenticity of the document enclosed. •	Where the appeal/petition/complaint is physically transmitted to the court of competent jurisdiction, the postmaster shall levy the charges of a registered letter from the sender. The record of the movement of the article from the post office to the court of competent jurisdiction shall be kept, as in the case of any other registered article. This shall, however, be without prejudice to the maintenance of a register in the prescribed format of appeal/petition/complaint received by the post office for onward conveyance to the court of competent jurisdiction. •	If no scanner is available at the approved centre/post office, then till such time the same is made available, the filing shall only be accepted in duplicate, duly signed, and one such copy shall be retained by the approved centre/post office in its records for a period of one year. •	The postmaster in-charge of the approved centre shall not be held liable for any inadvertent or unintended error committed in the course of discharge of his duties prescribed under these rules. •	The litigant shall be liable to pay a sum of Rs. 30 to the approved centre/post office as service charges. However, in the case of persons eligible for free legal services in terms of S.12 of the J&K Legal Services Authority Act, 1997, the charges shall be paid by concerned District Legal Services Authority. •	A person belonging to a remote area may engage any counsel of his/her choice. In case he/she desires so, the Jammu Kashmir State Legal Services Authority (JKSLSA)/concerned District State Legal Services Authority (DSLSA)/Jammu Kashmir High Court Legal Services Committee/approved centre shall provide legal service to such person. Authorization of the person conducting the case shall be appended. •	Case status and all other updates in the cases shall be uploaded by the concerned court hearing the matter on the website as well as in the case information software of the court. The parties shall be entitled to have access to the said update from a nearby court or through approved centre/post office as well as through SMS. Information regarding case status, orders and judgments shall be provided to the inhabitants of the remote areas by the courts or by the approved centres/entities/post offices as the case may be free of cost. •	The functioning of approved centers and post offices pertaining to filing of cases and maintenance of record in relation thereto shall be supervised by the Court of Judicial Magistrate, the Sessions Judge concerned or the Secretary, District Legal Services Authority. However, the administrative control over the Approved Centre and Post Office staff shall remain with the Approved Centre operated by the Government of India/State Government approved by the High Court and the Department of Posts, Ministry of Communications, Govt. of India, respectively. •	All the cases pertaining to the remote areas and filed under this chapter shall be distinctively and separately shown in the daily cause-list of the court and the Courts shall dispose of such matters on a priority basis. Weekly reports pertaining to the progress of these cases shall be submitted by the concerned judicial officer to the high court.